We recently had our club fishing day. We did some planting of trees on the river bank, had a barbecue and then spent a few hours fishing in the afternoon. I say a few hours but in reality it was about 6 hours of solid fishing. My total at the end was 2 fish, another one dropped and another good hit. I fished with Rico and he ended up with 4 with another one dropped. Two of his came from the one spot in the 5 minutes before it got dark. Short story is that the fish were well and truly shut down. 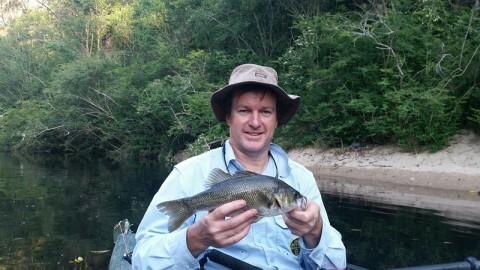 It was still great fun, kayak fishing in quiet waters is great even when the fishing is poor. And the company was great, we kept at it and stayed positive even with the lack of action. 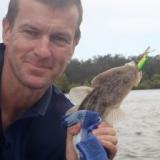 Tham who also fished that day did a barometer check when we got home and the results partly explain the lack of action. Native fishing success is often tied to the barometer. A steeply falling barometer being bad, and the lowest part of the fall being worst. In the graph above we were fishing on the 12th, not only low but on its way to the month low. Nothing conclusive in this limited data set of course and some others caught fish in the early morning, but it matches what others have observed. The fish may feed actively in the low light fringes but in the middle afternoon it's another thing altogether. I'm not going to stop fishing when the barometer looks dodgy, but I will certainly pay more attention to results. By the way, the fish above committed suicide (well it was actually released unharmed) by taking a soft cicada next to the yak in open water when I wasn't paying attention and nearly resulted in me tipping the yak over! Quality fishing!